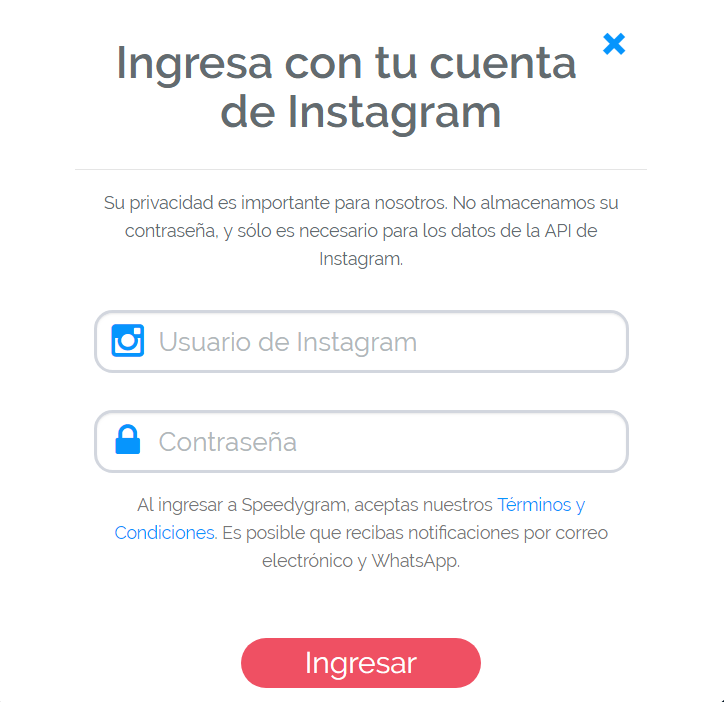 According to their website, “Speedygram” is a web service that automates the manual activities on Instagram: follow, unfollow and like”. Speedygram is right in our neighborhood of Instagram growth tools, so we decided to put Speedygram to the test against our own Instagram growth tool, AiGrow. 2) When you’re on the homepage, click “Free Trial” in the upper right corner. Congrats! You’re officially signed up on AiGrow. Begin by going to www.speedygram.co. When on the homepage, click “Iniciar Sesión” in the upper right corner. With Speedygram, you don’t need to create an account. You can simply log into your Instagram account. Here you can see all of your connected Instagram accounts (you can add multiple Instagram accounts and grow them simultaneously!). To add a new account, go to your dashboard and click “Add Instagram Account” or you can directly log into your Instagram account with Google Chrome Extension provided by AiGrow! Now from here, you can simply log into your Instagram account as you basically do on your phone. While most users are finished setting up here, some users might be asked to provide a 6-digit verification code sent to their phones or emails by Instagram. AiGrow encrypts your password and will not share it with anyone or use it for anything not related to growing your followers. Congrats! You’ve just set up AiGrow. After clicking “Iniciar Sesión“, you are taken to the following screen. 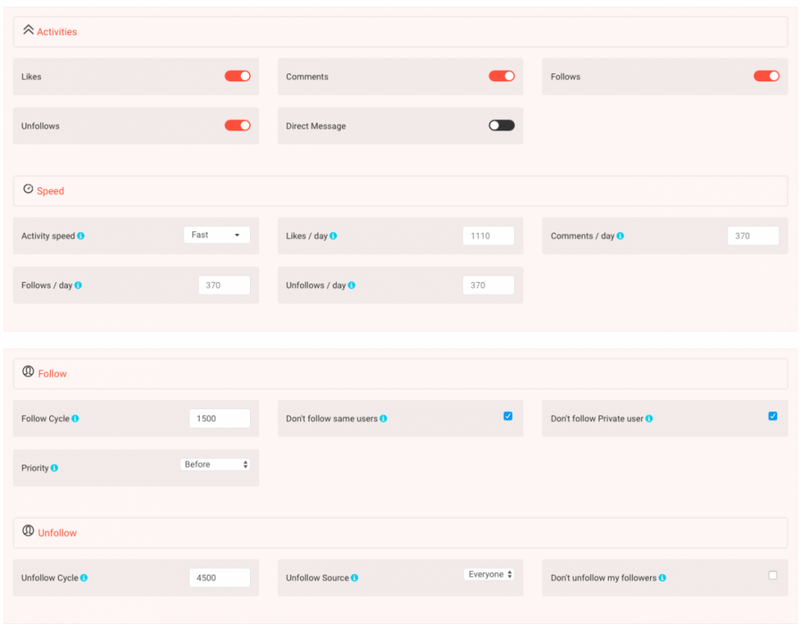 AiGrow uses your account to automatically like, follow, unfollow, comment, and DM on real channels in order to drive organic traffic back to your own account. This way, instead of purchasing lots of followers who don’t necessarily fit your target (which is really important if you run a small business or brand), you’re gaining exactly the kinds of new followers you need for your account. 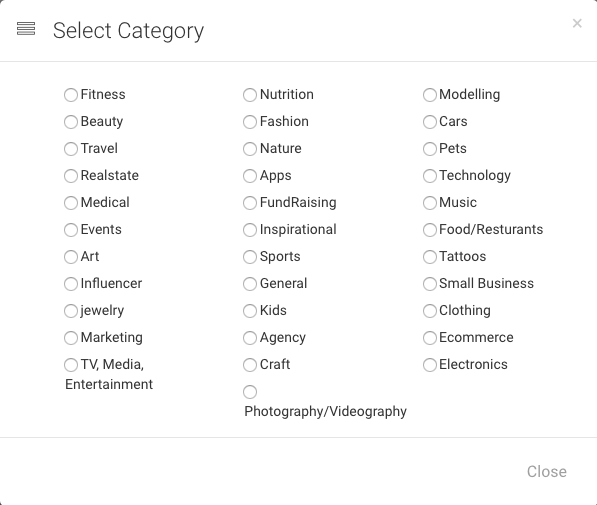 Furthermore, you can select a category that you think best fits your business. We’ll use this information to improve your targeting. Also, you don’t need to worry about engaging with inappropriate or risky accounts as you have complete control over the types of users you interact with. And be sure that AiGrow will never operate any extra actions to your Instagram account without your permission. AiGrow also automatically unfollows users who you follow but doesn’t follow you back within a certain amount of time to keep your follower/following ratio normal. 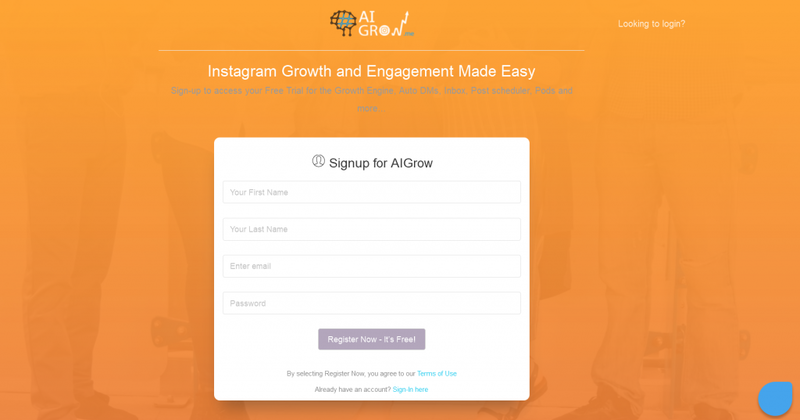 AiGrow also gives you the chance to join over 300 engagement groups FOR FREE which you can use to get more likes and comments on every new post you share on Instagram. Engagement groups are groups of people who commit to interacting through likes and comments with every post shared by a group member. Join any groups which are similar to your Instagram page by navigating to the “Engagement Groups” tab on your AiGrow dashboard and clicking “Join” under any groups you wish to join. Use AiGrow’s scheduler (post schedule feature) to post on Instagram. To use AiGrow’s scheduler, simply go to your dashboard on AiGrow and click on “Schedule Posts” tab, drag and drop your post onto the pop-up box (or you can simply upload from your pc), write your caption, add your hashtags, set the date and time and click “Schedule”. When your post is on Instagram, all the group members will automatically like and/or comment on your new post. Since the process is 100% organic, all groups are guaranteed to be leechers free, so you can be sure that all your efforts are not wasted. Ability to change your IG account activities based on likes, comments, follows and unfollows by determining your activity speed. 1) Target your audience. Pick the accounts that you are interested to engage with (to follow and get followed). For example, if you run a business, you can follow your competitors from your city and drive their followers to your channel. The more specific you are the better results you get. 2) Choose the hashtags that are the most used by your customers. Keep in mind to search the most popular hashtags (e.g. #socialmarketing). Select hashtags which are linked to your brand, product or service and finally use them in your posts. 3) Click on the “Inactivo” button to start. After this, you can go to “Estadisticas” tab and see your IG stats such as your followers, your followings, and your unfollows. Also, you can see your gained followers per reference profile (influencer) or your relevant hashtags. If you want to change your targeting options, you can go to the “Configuration” tab and make the changes here. After setting up your options, hit “Start Growth”. AiGrow will start to grow your IG account until you tell it to stop. If for any reason something makes your growth stop, we will automatically let you know on your dashboard. Also, we inform you through email and provide possible solutions. If you experience an issue, you can also likely find an answer in our FAQ page. We also offer free one-on-one appointments to help get your account set up, and our support team will always be there to guide and solve any problems you may deal with. 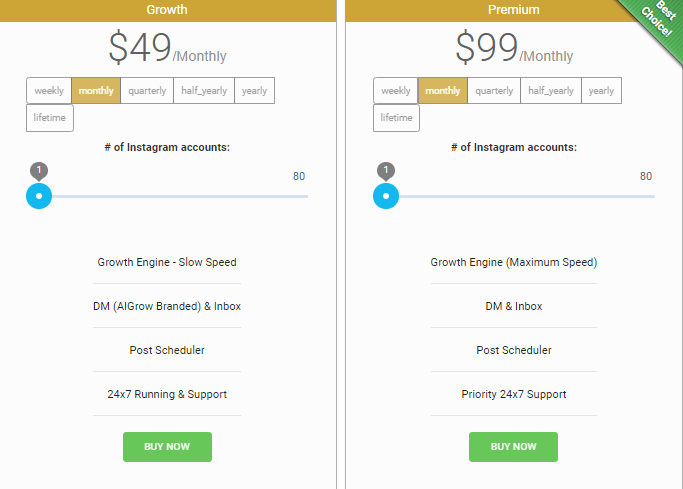 Similarly, after setting up your targeting options, Speedygram will begin to grow your account until you press the inactive button. If you have any issues with your account or any questions, you can visit the FAQ page or contact Speedygram by clicking “Support” on the left sidebar and you will be answered you as soon as possible. You can also read from Speedygram’s extensive blog or click on the floating button that takes you to their WhatsApp business account. Remember, you always can use AiGrow’s scheduler (slow speed) and Engagement groups for FREE. Everyone on Speedygram gets a 3-day free trial. Speedygram is a good Instagram growth tool with a simple experience and little work required on your part (only three steps). If you need a simple tool that automates the activities of users on Instagram like follow, unfollow, and likes then Speedygram could be a great option. However, if you are specializing in Instagram and want the ability to start, stop, and customize your growth at any time, then AiGrow offers a much better experience. Want to sign up and try AiGrow for free? Click here. For those interested in trying Speedygram, click here to visit their website.